Recycling in Phoenix is in need of your help. If you live in Phoenix, it's likely that recycling near you needs to be improved. Sadly, Phoenix has a poor showing when it comes to recycling. According to AZ Central, Phoenix’s waste-diversion rate is only about 20%. 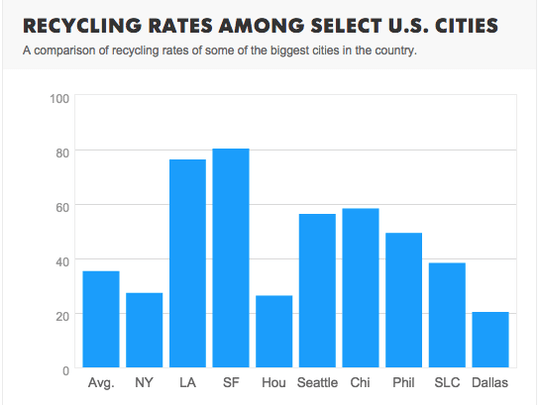 In comparison to other large US city, recycling in Phoenix ranks on the bottom rung. The average American city rates around 34%, even Los Angeles has a better rate than us at 76%. Los Angeles! We should be ashamed. 2014 Residential Recycling Efforts throughout Phoenix cities. Figures are based on the percentage of items diverted from landfills to recycling centers. In 2014 Phoenix ranked at around 20% in diversion of trash from landfills to recycling plants; however, about 6% of that is due to companies like ours who haul recyclables directly to the recycle plants. Therefore, without contractors hauling residential junk to the recycling facilities, the true figure of diversion of junk from landfills in Phoenix is 14%. “When I voted for those goals, I meant it," he said. "We have to up our game on public education and creating more of a conservation ethic day to day." And as an oasis in the desert he’s right. We can’t afford to waste things out here. The City has launched few new programs in an attempt to help residents recycle. One of their first moves was to place out more roll-off recycling stations all across the city. The bins help residents not only by being accessible but also by educating them on what items can and cannot be recycled. Each roll-off station had a list of the most common acceptable items. Educating residents on what to recycle can significantly increase our numbers because even one incorrect item can contaminate an entire load of recycling down the line. The basics of what you should recycle are: plastic bottles, empty soda or food cans, newspaper, junk mail, white paper, plastic jugs and jars, glass bottles and jars, and cardboards. The list of things that can go the blue bin is really just this short. If it is not on the list above don’t put it in there. On the other hand, the list of non-recyclables is very long, and we’re certain you’ll find at least one thing on here that you recycle all the time. For a full printable list of approved everyday items download this PDF. First, no fast food cups, or any other box, bag, or container that has a plastic or waxy liner. The liner is made of a different type of plastic and cannot be separated from the container, thus making the entire container non-recyclable. Second, food residue. We know it seems like paper plates should be in the recycle bin, but no, not if they have food on them. The residue from food contaminates the recyclable materials. It is especially bad to recycle pizza boxes. Seems legit to place all that cardboard in the bin, but grease from the pizza will jam up the processing machines, and cause a lot more problems than just adding that box to the landfill. Remember, no paper plates, napkins, or even plastic utensils. We all know by now, no plastic grocery bags in the blue bin. They get tangled up in the machines and they cost a lot of money to fix. Also, no bubble wrap or other plastic packing material, including styrofoam. In addition, recycling plants will charge more if the load is contaminated with un-recyclables, and guess who that extra charge will filter down to? Yup, you and me. The City of Phoenix estimates the cost of recycling contamination is $1 million dollars every year.